Should Hand Assistance Be Used for Mid-sized Spleens? Introduction: Laparoscopic splenectomy has been shown to offer several advantages over open splenectomy, and has become a standard for splenectomy. Hand-assisted laparoscopic splenectomy has been studied in splenomegaly greater than 17cm and has been found to be safe and efficacious. 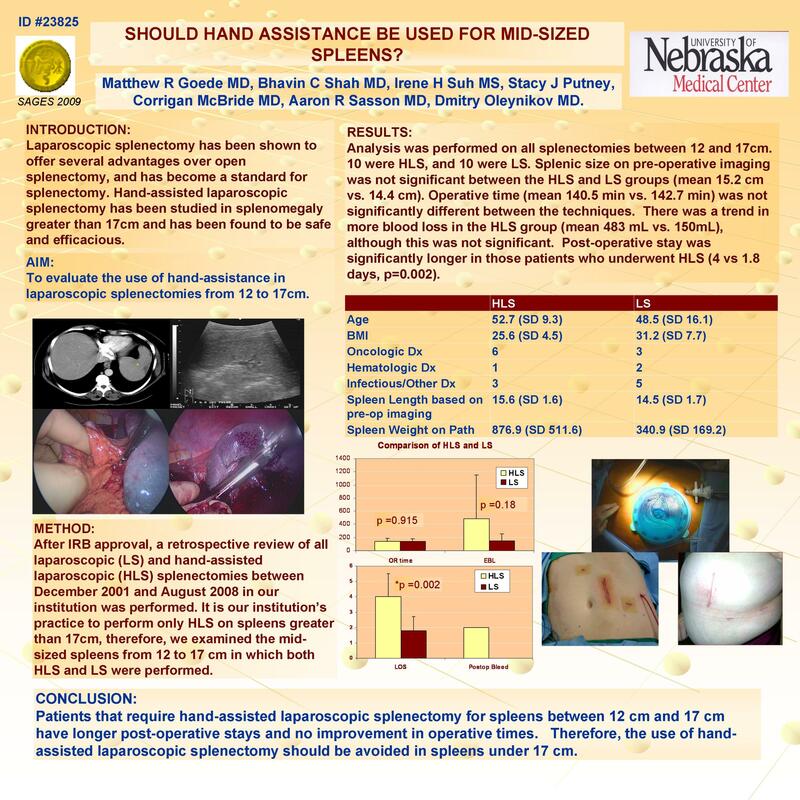 Aim: To evaluate the use of hand-assistance in laparoscopic splenectomies from 12 to 17cm. Methods: After IRB approval, a retrospective review of all laparoscopic (LS) and hand-assisted laparoscopic (HLS) splenectomies between December 2001 and August 2008 in our institution was performed. Results: Of the 46 laparoscopic assisted splenectomies, 24 HLS and 22 LS were performed for both oncologic and hematologic indications. Both groups were similar in age, gender, BMI, operative time, blood loss, and post-operative stay. There was a statistically significant difference in spleen size between LS and HLS. It is our institutions’ practice to perform HLS on spleens greater than 17cm. In the HLS group, there was more post-operative ileus and bleeding requiring re-exploration. Further analysis was performed on spleens between 12 and 17cm. 20 splenectomies were performed in this size group, 10 of which were HLS, and 10 of which were LS. Splenic size (mean 15.2 cm vs. 14.4 cm) was not significant between the HLS and LS groups. Operative time (140.5 min vs. 142.7 min) was not significantly different between the techniques. Post-operative stay was significantly longer in those patients who underwent HLS (4 vs 1.8 days, p=0.002). Conclusion: Patients that require hand-assisted laparoscopic splenectomy for spleens between 12 cm and 17 cm have longer post-operative stays and no improvement in operative time. Further prospective studies are required to evaluate if the use of HLS negatively impacts patients with mid-sized spleens.